""" keywords'/> "" " Acting School or Acting Coach for Bollywood Entry? Choice | Best Actor Academy-The Monster Of Free Acting Tips ""
What Special Skills Should Every Aspiring Actor Have? Acting is a very specialized profession, and it typically requires a number of special skills. A good memory, for instance, is one of the greatest skills that any actor can have. If acting in front of a live audience, such as in a stand up comedy or theater, actors must be able to memorize all of their lines. Movie and film actors should also be able to memorize NOT ONLY their lines, but also of their partners as well. Aspiring actors should also be able to easily portray a character’s emotions and personality. For example, they should be able to make others truly believe that they are the character that they portray. Research skills are also excellent for any actor to have. These will often come in handy when researching an upcoming role in an audition, such as for a historic character. Actors should also be able and willing to work hard. Before a production, actors will typically spend long hours studying a script and practicing their lines. Movie an film actor will need to be available to work at nearly any hour of the day in any sort of weather. Some physical stunts are also required as well. The right teacher whether in a class or as a private tutor can make all the difference in fulfilling your dreams to be a Bollywood Star, and can provide valuable contacts and skills that will help along the way. Acting is a specialized type of performing arts, and it generally requires a great amount of skill. Although some actors are naturally talented, it often takes some type of formal training to get the most out of these talents. Because of this, many aspiring actors choose to attend performing arts or acting schools or hire an acting coach or a mentor. They give you a base (a platform) to work from. They give you various acting techniques that you can fall back on and recreate time after time in different situations. Taking acting classes will enable you to see the other actors work, which in itself is invaluable! You will see how other actors overcome some of their own issues while acting and interpreting their roles. If you have a good teacher (hopefully) and can give you sufficient time individually, he can give you good, constructive and personal feedback to help you improve your craft. They will give you a sense of community (colleagues), so that you know you are not alone in your quest to become an actor. If you have a good acting teacher who is known and respected in the industry, you could gain (in him/her) an ally who might help promote you, get you auditions or help you work to get seen by the right people! A coach can create and give you solid acting techniques, based on your individual emotional, mental and physical built up that you can fall back on and recreate time after time in different situations. He can help you to be able to access your emotions and learn methods to control and alter it. Can help you to see where you need to improve. Can give you good, constructive and personal feedback to help you improve your craft.. He can make you more comfortable while performing. The most important- will guide and create a marketing strategy like your website, social networking on Facebook, Twitter, LinkedIn, for you to succeed. Will guide you on how and where to go for making your portfolio and show reel. Although, acting schools cannot design a program on an individual basis, and cannot devote hours separately to each student, the success at school will depend on the quality of faculty. The schools are a good source for learning and working in a group with other students with distinct advantages. Secondly, these schools could be a good source for networking and getting information about auditions, castings and industry. Whereas, with an acting coach, as each individual is different and unique, each aspiring or even experienced male or female actor can learn and develop amazingly well with an individual coaching. A coach is your mentor, and a friend who walks with you to help you to win as it is in case of a sports coach. You can share your problems, worries and fix them without any fear of a crowd around. The coach may understand your psyche and can design a learning program. You may terminate an acting coach contract after the period or may continue seeking his/her guidance for a long period. Taking into account that acting school courses may range from a few months to a few years with the fees from Rs 50,000 to 9 Lacks, I would recommend to join an acting school if finances are no problem, can wait for months and have some acting experience. However, if you are ignorant about acting craft, do not know about the Bollywood or TV Serial industry, want personal attention with limited finances, then an acting coach is the best choice for you. Nice post. Can you suggest a combination of acting school and an acting coach? 1/ Join an institute which has apart from acting's training, film making and direction courses, rather than joining a school, which has only acting course. Every student of direction and film making course has to make a short film before getting a diploma. Obviously, if you are developing into a good actor and serious, they will definitely give you a chance in their films. Secondly. these institutes are not very expensive like the ones where they charge couple of lacs and take 1 to 3 years of your valuable time. 2/ There are coaches who apart from training in schools train privately. You may have to contact schools and meet teachers, privately. ZIMA (Lokhandwala, Andheri W) and Digital Academy (MIDC Andheri E) are the examples of where, apart from acting, have direction and film making courses as well, where an actor can get a chance in short films, and are not very expensive unlike, for example "whistling woods"
My experience of acting class in Mumbai had been bad. The senior teachers comments are sarcastic if a student does not perform accordingly. They charge heavy fee. The environment sometimes is shameful, even girl student use bad words and do not take learning seriously. They provide no help in career planning and promoting an actor. For person like me who comes from a small place in UP, it is a shocking experience. I seriously wanna become an actor.I have seen many acting classes but can't make my decision where to go.I am searching for such a school where fees is less and it is an affiliated one. Your statement above-is it a comment or a question? It's not clear. For making a bright future with acting, you can join the Treehouse Acting School. This is a place for all types of person like beginner or professional. I think you are really really helpfull. I am from Nepal and I want to learn acting from you. So i will came to your city and is it is a good dession . Plz reply me what shoud i have to do. I'm not casting director, but an acting coach. There is a post on this blog where there are details of casting directors. Read that post. Though you can join any good acting school but, as you are a new aspiring actor, I would suggest to join an acting coach and you can think of a school if you have a couple of Lakhs of Rupees. 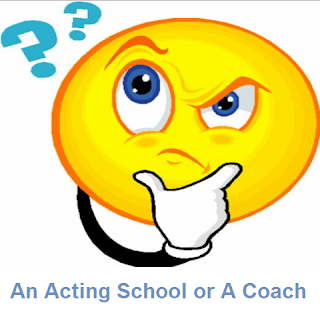 Firstly, I recommend a personal acting coach, rather than a school because you are a beginner and would need individual learning or you may be frustrated. This is not learning history or physics with 20-30 students together. Secondly, with your budget, an acting coach will suit you better. hello sir aapke institute mai kitne din ka course hai aur fees k sat plz mujhe rly kre than you ?